KELMSCOTT footballer Jayden DiVauz received an award for being the best player of the 2016 State Program in the Under-23 side this season. D’Vauz (22) won the L.A. Tetley award for his attitude and leadership playing for WA against Queensland and Tasmania in June and during training sessions in the lead-up to the games. The squad undertook a week-long road trip to play in Brisbane and Launceston, coming away with two victories. They defeated Queensland by 14 points and thumped Tasmania by 64 points, with D’Vauz awarded best on ground in the Launceston clash by the WA Amateur Football League team. 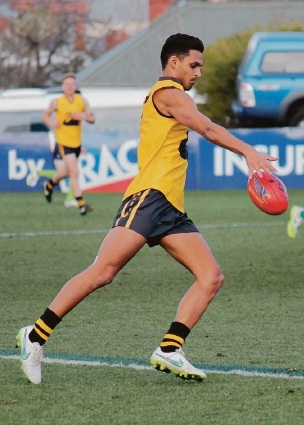 He has been playing for the Kelmscott Football Club since the start of last year following a spell with WAFL team South Fremantle. It was the second time he had been picked for the WA team as a running back man and said he had enjoyed the experience. D’Vauz said he was looking forward to playing with the Bulldogs again next year. “I’m not interested in going back to the WAFL at the moment, I’m just enjoying my footy and playing with my mates,” he said. D’Vauz said he enjoyed playing with other WAAFL players in the State squad and the experience had helped to improve his game. “I’ll give the State team another shot next year if the opportunity comes up,” he said. D’Vauz said he was pleasantly surprised to receive the award. He is taking a break from footy until after the Christmas period before ramping up pre-season training again.